Bottom line: Having tried numerous family locator services, both independent ones and those affiliated by a carrier, I am more impressed with Verizon’s service than others. Its features, including notifying me when location service are turned off by a family member, the ability to check the speed a family member is driving at and the social media check in option, are all attractive to tech savvy family. I am not, however, a fan of the monthly almost $10 fee or the fact that I will need to download an app to improve accuracy. It the service works off of GPS and cell tower transmissions, an app should not be necessary. I would also prefer to add each of my family members myself than have them do it individually. With teenagers, this can take a lot of time and most may be reluctant to do it at all. Pros and Cons: If it actually worked even 50% of the time, the ability to check the speed your child is driving at would be an amazing one. From what I’ve gotten after speaking with friends that have tried to verify the validity of this feature, though, it has worked about 20% of the time. 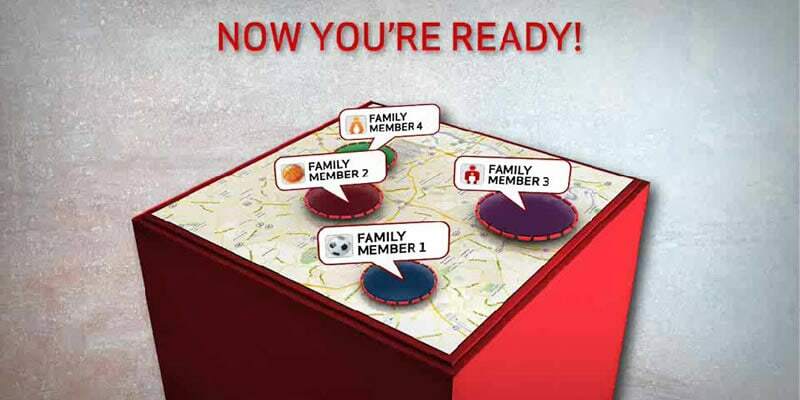 The the ability to get directions to find each of your family members directly from the map interface. One of the many cons is that it requires you to download an app on your phone (if your phone is capable of it). With limited storage on some phones and expensive data rates, I’d prefer to have a service that does not require the use of an app at all. Most younger children tend to have basic phones and parents will not be able to download the Verizon Family Locator app on them. When I was a child, my mother kept tabs on where I went and what time I came home by asking me to call her on a pay phone or paging me and asking where I was. Today, all a mom has to do to find out where her children are is enroll in one of many family locator apps/services available and she can find them on a map on her cell phone or computer. 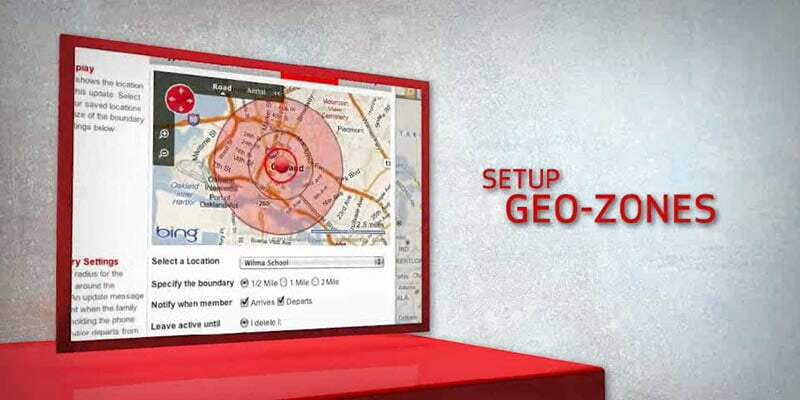 These locator apps are also becoming popular with spouses and dating relationships. 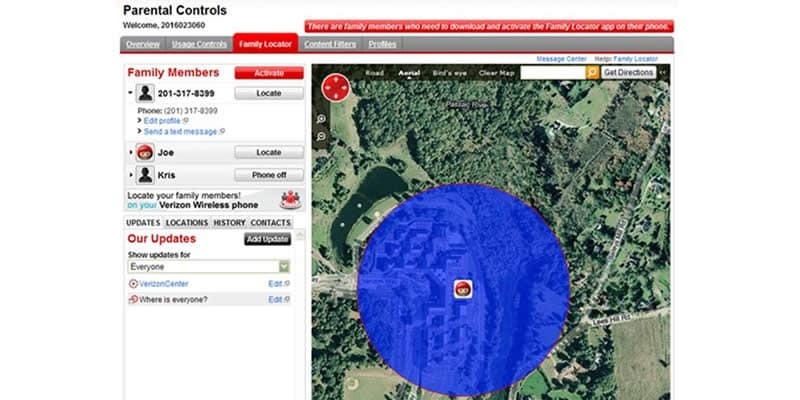 One example of these popular services is Verizon’s Family Locator. 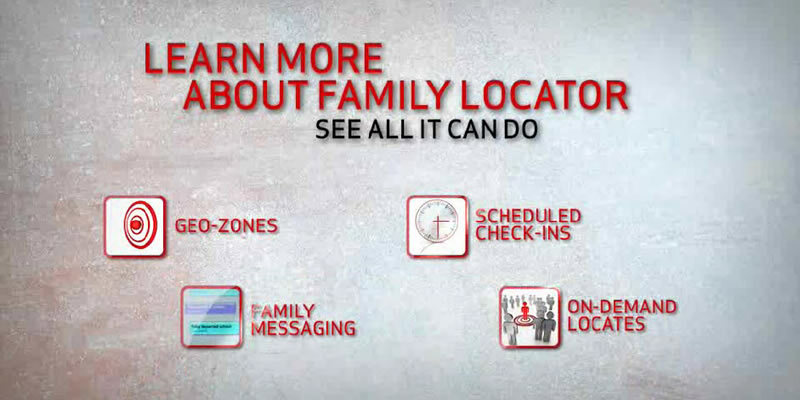 Verizon’s Family Locator enables subscribers to find a family member’s phone on an interactive map via a computer or mobile device. It allows a parent to see when their child or spouse has arrived at or left a location without the need for a phone call or “check in”. Similar to AT&T’s locator service, Verizon’s Family Locator features pre-scheduled text alerts to inform you of your family member’s arrival or departure without needing to look for them on the map interface or contacting them. 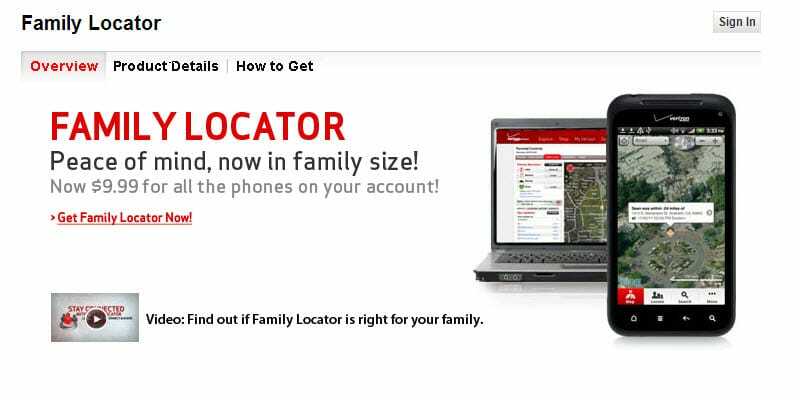 In order to set up Verizon Family Locator, you’ll need to go to the Family Locator Products page on the Verizon website. You’ll need to add a Family Locator subscription to your account and then register yourself as an administrator. After registering as the administrator, you can begin adding family members as participants. Each participant will also need to register on the Family Locator account on the Verizon website prior to being able to use the locator service on their own devices. They will then receive a log on and password. If you do not already have a My Verizon account as an administrator, you’ll need to set one up before subscribing to the Family Locator service. To obtain a My Verizon account, all you’ll need to do is register your phone and your family members’ phones online on the Verizon website. This ensures that only those on your My Verizon Family account can view and track locations of phones. If you prefer to deal with a live person on the phone, you can also sign up by calling Verizon customer service. Once you’ve signed up for the service, you’ll need to enter your family members’ phone numbers and names. Verizon will then send them a text message requesting their permission to be tracked and, once they’ve accepted, you’re ready to use the service.  Setting up Family Locator on your phone is fairly simple as well. I am not very tech savvy with my new phone (since I’ve yet to read the instruction manual) and was still able to successfully start using it in minutes. First, you’ll have to turn on your location services. If the GPS on your phone is not on, the location will be very inaccurate and delayed. You’ll also need to install the Verizon Wireless Family Locator App either from the Apple App Store or the Google Play market for Android. If your phone does not have a data plan or you do not have a phone that is able to download apps, you’ll still be able to use and participate in Verizon Family Locator but the accuracy of the location will be affected. In addition, if you prefer a short tutorial, you can click a link in the welcome text message and it will guide you through the steps. After downloading and installing the app, you can open up the map interface and begin to see the location of your family members. the user interface on Verizon’s Family Locator is one of my favorites. The aerial view is very detailed and it has all of the options you’re looking for at your finger tips on the bottom of the screen. The accuracy varies depending on the area you’re in and the type of phone each family member is using. Obviously, smart phones will give a more accurate location since they have better GPS capabilities. Phones in more densely populated areas will also be more accurate than those in suburban or rural areas. When I used it, I found that the location was often off by a few blocks, sometimes more. This made it difficult for me to know exactly where my daughter was since she has several friends close by within the same neighborhood. Ideally, I prefer more reliability when it comes to location accuracy, especially if GPS is enabled and I am in a rather large Los Angeles suburb. Verizon Family Locator may be lacking in some areas but it does have some attractive features. Similar to AT&T’s family locator service, Verizon’s service features preset alerts to notify you when a family member has arrived at or left a location. Going along with the social media frenzy, Verizon Family Locator allows its users to check in their location and share it with friends on social media sites such as Facebook. It can also provide directions that will lead you directly to your family members from the map interface. This is assuming that the location is accurate, of course. One of my favorites as a mother is the ability to check the speed your child is driving at with the service. I have my doubts one the accuracy of this feature, though, and have yet to test it myself. Several of my friends have tried to use it while their child was in the car with them and it had them moving long after the car had come to a complete stop. Again, the accuracy of these features will vary greatly with the type of phones your family has and if the GPS is turned on or off. In addition to the above features, Verizon Family Locator can also notify you if any of your family members have turned off their location services. This is a plus since many teens may opt to those this to avoid being tracked. Verizon Family Locator will cost you $9.99 per month. You can add up to 10 phones to the account and they do not all have to be on a family plan as with AT&T. Although for the service to work, you have to have Verizon. Verizon was offering a free 30 month trial period for the plan earlier this year but that offer is not currently available. It will likely return and, since it is almost $10 a month, I’d probably wait until they offer another free trial or give one of the other locator services a shot first. There are plenty that offer free trials and are more inexpensive as well. LociLoci is one that can be used with any carrier, is only $5.99 per month and is currently offering a free 7 day trial period.